What do you believe is crucial when designing for such a popular brand? First and foremost, one mustn’t think in terms of diktat — in the sense that a particular type of jewellery or watch should be worn in only certain ways, at certain times or only by certain people. A broad vision is key. We are present in 170 countries, so we have to think on a global scale, because no woman in the world wants to be confined to one style. This is why we go for versatility, wherein you can adapt from day to night — or from minimalistic to statement. How do trends play a role in your creative process? It’s very important for us to be aware of them, so that we can then curate and decide which ones we want to use in our unique way. There are a number of trends that we consciously don’t follow. This is why, when I moved up within Swarovski, I created a separate division with people who are trendspotters and analysts who can tell us what the next big colour or silhouette will be. And because jewellery is worn with clothes, obviously, we have to look at what’s hot in fashion and see how it will affect our creations. How do you ensure that your creations remain timeless? To me, diversity of style is essential, because what is wearable for one person may not be as wearable for someone else. For example, what I have on right now during the day, most women would wear only at night. So when you have a palette comprising various techniques, sizes, proportions, colours and textures, you become relevant to more people, and for a longer time. Another thing we do is pay close attention to the fit. We try on every piece of jewellery relentlessly and make adjustments to the proportions and weight at least four times. There are very clear guidelines in place like how heavy earrings should be, or how a bracelet should sit on the wrist. 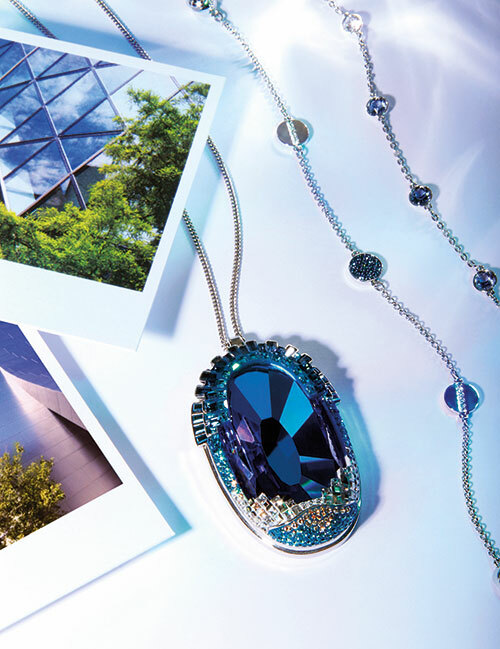 What do you believe is the one thing that wholly describes Swarovski? Sparkle! Also modernity, and a unique twist on glamour.